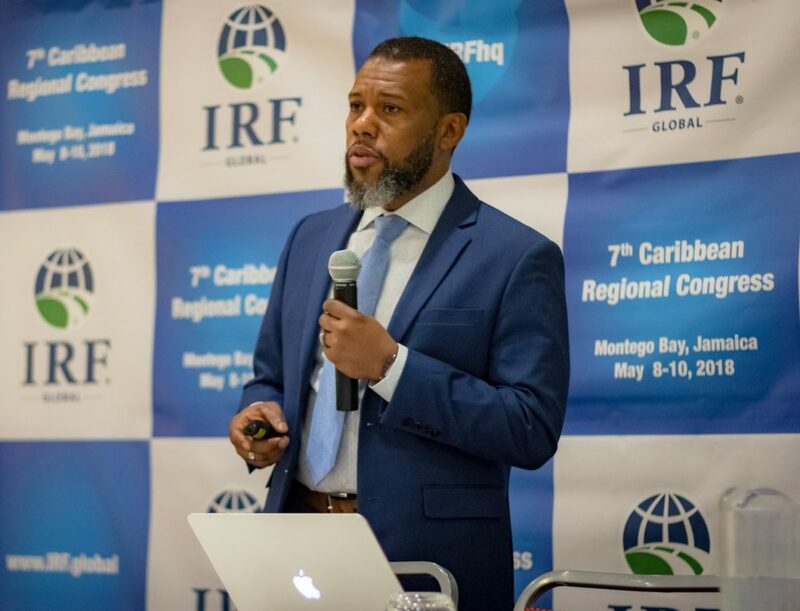 Now in its seventh edition, IRF’s flagship event in the Caribbean confirmed its status as an essential gathering point for the region’s top transportation decision-makers and professionals, combining regional case studies and international insights. Close to 150 delegates from 10 countries, including senior policy makers from Jamaica, Belize, Guyana, Cayman, attended the 4-day event. A focal topic for the 2018 Congress was the development of safer and more resilient infrastructure capable of withstanding increasingly challenging weather patterns. Opening the event, CDEMA Executive Director Ronald Jackson noted " We are witnessing a steady increase in vulnerability and exposure over the last decade in all the Caribbean Territories which have the potential to impact adversely on road infrastructure, both directly and indirectly. Damage to road infrastructure has secondary effects, cutting off access of affected persons to emergency relief and essential services for extended periods”. Jackson added that these recent events have reconfirmed a number of lessons on ways to address resilience within the sector, such as the need to prioritize the integration of risk and disaster management measures into the road construction and maintenance processes, the importance of applying rigorous building standards as well as the importance of promoting risk informed and risk sensitive development strategies”. IRF Executive Committee Member Dr. William Sowell noted "Adequate preparation for a man-made or natural disaster should be an on-going process. Whether it is back-up power sources for signalized intersections, real-time video surveillance for optimal roadway network command and control, or being able to implement contra-flow traffic patterns to exfill the population from dangerous conditions, prior planning and execution of the disaster plan is essential for saving saves and property." Road safety continues to remain another key preoccupation for the region’s top transportation policy-makers. Transport & Mining Minister H.E. Robert Montague recommitted his country to a long term agenda of safer roads. Jamaica, he noted already uses the “Human-Environment-Vehicle Model” in designing its road safety policies. With the advent of black boxes, he expresses his hope that crash investigators would complete their understanding of road traffic crash patterns. “Jamaica will be in the very near future providing the globe with highly trained and skilled Traffic Accident Investigators, Analysts and Reconstructionist”, Minister Montague pledged, praising a recent initiative led by the Ministry to develop traffic crash investigation skills through training workshops. The event concluded with the official launch of the IRF Caribbean Affairs Committee, open to IRF members, whose goals are to strengthen regional collaboration, foster IRF Training and presence in the Caribbean, find and support IRF Fellowship Candidates and interact and work with other international entities wherever appropriate. IRF will return to Jamaica in 2019 for an international road safety conference.